I’ve done 4 (well 5 now!) routes on the South Side of Mont Blanc, but it’s always really appealed to me to come back there in winter. 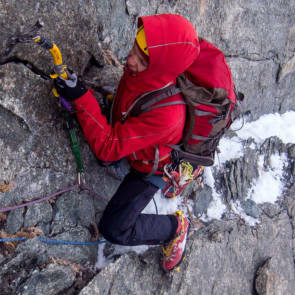 It’s the remotest part of the range and as far as routes go these are about as committing as you can get - big faces like the Jorasses you can rap off at any point, but retreating off the South Face in winter is desperate. 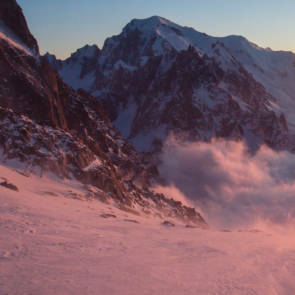 To even access the area in winter you need skis and you need to climb there over the Aiguille Blanche de Peuterey, across the Freney glacier and then up the Col Eccles. A climb in itself! 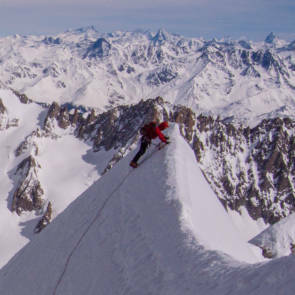 Climbing up the south side tops you out on Mont Blanc in winter so you still need to ski down its North face to town safely to finally tick this monster climb off. I had no idea what conditions were going to be like on the Freney and Brouillard faces so we went with a very open plan. The idea being that I wanted to climb something technical but it couldn’t be too hard and long as I was going to have to haul my pack up (skis). In the end I managed to team up with Ben O Connor and Tom Grant and we set off for the Fourche hut for the first leg of the ‘journey’. Arriving at the Fourche and it was pretty cold which was a good sign. The following morning we would have to run under the gauntlet of death- the huge seracs that hang over the Brenva side of Mont Blanc. I’ve done this before and wasnt looking forward to doing it again espeically as they released once in the night and one again as soon as we left the hut the following morning. In any case it’s always better than you think, and we were soon heading on up the N face of the Peuterey under a perfect winter sunrise. The NE slope (?) to the Col went by without any problems. There was a fair bit of trail breaking to do as you can imagine this time of year but we topped out on the Freney Glacier nice and early but being battered by howling winds. Thankfully we were in the sun so the winds were manageable. Looking up at the Freney Face above was not ideal. All the ice lines were missing huge patches. The only thing that was fully ‘there’ was the Freney Icefall and it was looking decidedly brown in colour- not a great sign. But the Freney Icefall was our main objective so at least it wasnt a streak of black choss- we ditched our skis at the base and continued on over to the Eccles Bivouac which took forever under the deep snow. The following morning we left nice and early for the Freney Icefall. It was oddly warm for a February morning and thankfully the winds that had been buffeting the hut all night had abated. All in all you couldnt ask for a more perfect winter alpine morning. Dawn broke as we started in the couloir. As it has been so windy up high the entry pitch is not an easy snow and ice romp but a hard and chossy mixed pitch- a real lesson in how to climb mixed with skis on your back. I managed to pull a hold off as well and ripped apart a couple of fingers in the process in the ensuing fall- not a great start to the day. Once established in the snow couloir above Tom took over and broke trail all the way to the ice fall. It was pretty obvious from lower down that the ice quality was poor to say the least but I wanted to actually get on the thing before bailing- our plan b routes were just to the side anyway and I wanted to at least feel first hand that the ice was a hollow nightmare before just assuming it was. Might sound daft but it’s a long way to the Freney face and I didnt want to give up my chance at one of the classics that easily. The first pitch was ok. Chewy ice on the initial section felt amazing under the sun but this soon led to white hollow ice and snow formations- this was the problem really. The second pitch reared above and looked more Alaskan in quality than European. I wasnt sure really what was under all the white ice but it didnt take long to confirm that it was just skeletal ice clinging on to the face- even if it was really thick it would be a battle, and a dangerous one at that, to keep on climbing. 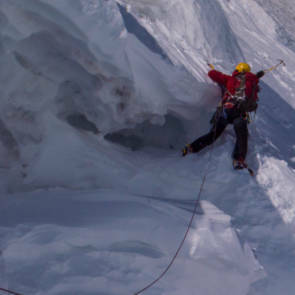 We didn’t really have time to part climb the ice and then rap back down for another option- so I pulled the plug apologetically to Tom and Ben and made a monster traverse across the face towards the Bonatti-Zappelli Direct. The snow was horrendously deep and starting to get wet. Once on the ridge it was trench warfare for a while- unconsolidated snow over huge boulders. Lots of digging and lots of falling into holes between rocks. After a hundred meters or so things started to get a bit better though- less snow but the rock quality quickly degenerated as well. As I didnt bring a guide book i had no idea where the ridge would lead to or whether it had even been climbed before so it was kind of adventurous leading up through it all. After some cruxy 5a rock sections and plenty of delicate climbing I arrived on the Petuerey Arete relieved that we could start moving at a faster pace. Ben took over up through a very ice arete and we finally arrived ontop of Mont Blanc du Courmayeur in the sunshine and warmth. 20 minutes later and we were celebrating climbing the South Face in winter on Europes Highest summit. Psyched! A quick stomp down the Bosses ridge to the Vallot hut and we strapped our skis on. This was going to be the interesting part. We had no idea what snow conditions were going to be like and I wasnt feeling too excited about skiing the N face with the approach ski and Spantik set up given how many seracs and crevasses there are on the descent. Tom and Ben took over the descent as I’ve never skied down Mont Blanc before and it was interesting to say the least. The seracs on the upper plateau are terrifying right now- huge debris fields everywhere and not a safe looking one hanging over our heads. We skied like machines but there were also crevasses everywhere to negotiate so it was with a huge sigh of relief and burning legs when we finally got out of the killing fields. Crossing the Bossons glacier and night fell. Up til here the snow quality had been ok but from here down to town it was like quick sand and I was definitely starting to hate life. 7pm and we glided into town, ready for some food, water and a well earned shower.